Reviewed: The Acer Aspire 5733 laptop is very affordable, aimed at the budget consumer market. Complete with a speedy Intel Core i3-370M Processor, 4GB of DDR3 RAM, a spacious 500GB Hard drive, DVD SuperMulti DL, LAN, WLAN, Webcam, and the reliable Windows 7 Home Premium 64-bit operating system, this laptop offers a high specification at a very low price. Below is our review of the Acer Aspire 5733, a 15.6" laptop, featuring 4GB RAM, 500GB hard drive and Windows 7 Home Premium 64-bit. The Acer aspire range of laptops (or notebooks, depending on your preferred term) offer very high specifications at affordable prices. Typically they provide a higher specification than their similar priced equivalents from other rival manufacturers such as Sony and Apple, Acer are renowned for offering value for money and reliability to their consumer laptop market. Due to the growth of graphics-intensive multimedia software packages and applications, the Acer Aspire series of laptops use today's best processors and memory options to keep your laptop as running and smoothly and efficiently as possible. The Acer Aspire 5733 comes fitted with the powerful Intel Core i3-370M Processor, which is specifically designed to give you superior multitasking performance, enabling you to be able to work faster, with less time wasted spent waiting. In addition to this faster performance, the processor enables you to experience superior playback of HD content over the Internet, as well as enabling you to enjoy the best of Windows 7 on your notebook. 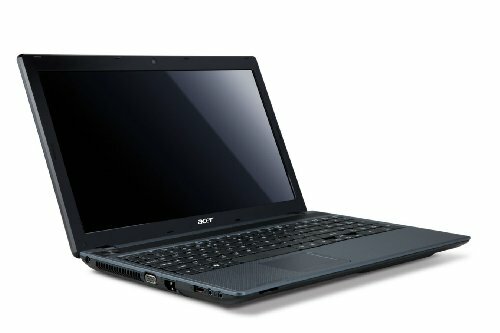 The Acer Aspire 5733 laptop comes with a crystal clear HD 15.6" Acer CineCrystal LCD screen that presents sharp imagery and text, whilst the LED-backlit technology enables the unit to consume less power, and thus increase battery length. A beautiful widescreen 16:9 aspect ratio screen increases the visible viewing area on the screen, while a high quality detailed resolution displays amazing visuals in HD for a stunning viewing experience. The Aspire range also includes super fast 4gb DDR3 memory, operating at a speed of twice that of DDR2, enabling you to experience fast and efficient performance from your Acer laptop. In additional to that, a fast and spacious large capacity hard drive provides ample space for your work, media, photos and other files - this laptop is highly flexible whatever your requirements. Also included is the integrated graphics chip - This enables you to experience great HD video playback via the dynamic video memory technology, crucially within the same low-power bracket as the AMD E300 1.3GHz processor, enabling you superior battery life whilst up and about, making this laptop truly portable. The Intel graphics chip also enables Microsoft® DirectX® 10 support, which will allow you to play some games whilst you're on the move. Keyboard multimedia controls are also included to help you control media playback - these enable you to stop, play and skip ahead all at the simple touch of a button You can surf the internet and stay in touch with friends, family and colleagues and much more via either Ethernet or Wi-Fi, both providing the Acer 5733 laptop with high speeds and a reliable connection to the internet. The software that comes with this laptop includes McAfee Internet Security Suite Trial, Acer Backup Manager and much more - helping you to stay secure and to enjoy the experience of your laptop worry free. The inbuilt webcam and microphone provide you with a clear picture and audio so you can take part in video chats and stay in touch over distances, and the beautiful keyboard and touchpad provide easy and accurate input, whether you be word processing or surfing the net - you stay in control. Also included is a card reader, which accepts both SD - Secure Digital - and MMC - MultiMediaCards - making backing up your photos and movies easy. If you are looking for a high spec laptop at an affordable price, the Acer Aspire 5733 range could well be the answer for you. Acer's background Acer are a Taiwanese computer hardware and electronics company, with headquarters located in Xizhi, New Taipei City, Taiwan. Founded by Stan Shih and a group of six others in 1976 in Hsinchu City, Taiwan, as a company called Multitech. This company initially produced the Micro-Professor MPF-I training kit, followed by two Apple II clones; the Microprofessor II and III. Shortly afterwards they expanded by joining the fledgling and fast growing IBM PC market, Multitech soon became a prominent PC manufacturer. In 1987, Multitech was renamed to Acer, and their low overheads resulted in their computing product range offering exceptional value when compared to products made by many of their bigger manufacturer rivals. This has helped aid their dramatic growth - from being in the top 15 of PC manufacturers in the early 1990s to overtaking many of their rival companies, including the giant Dell corporation, to become the world’s second biggest PC manufacturer (in terms of unit sales), in the late 2000's. Acer now own controlling interests in companies such as Packard Bell, Gateway Inc, and eMachines. If you need a microwave, then you'll be interested in our new section: We will soon be adding a microwave oven section to our website, where we will provide reviews of solo, grill and combi microwaves, as well as cheap microwaves and other kitchen appliances. The Logitech S150 speaker set are a portable budget speaker system, which is an ideal upgrade for users wishing to improve their sound quality on a budget. The Logitech Z623 speakers are a high end and versatile PC speaker system, which will work with your TV, music player or games console, providing incredible sound quality. The Logitech Z205 laptop speakers is a speaker system specifically designed for laptops - dramatically improve your inbuilt laptop speakers with this simple Logitech upgrade. The Samsung NP350V5C 15.6″ laptop is a great mid-priced laptop, with an impressive specification that belies it’s relatively low price tag. Currently available at around the £420.00 mark, it offers a speedy processing power, in the form of the reliable Intel Core i5 3210M 2.5GHz processor, in addition to the 6GB of fast DDR3 RAM, a 500gb hard drive, which should be ample room for all of your music, files and photos, all running on the excellent Windows 7 Home Premium 64-Bit operating system from Microsoft.